Living in a shared house can be one of the best periods of your life but can easily turn into a total nightmare. Usually the main problems with co-housing comes with the cleaning and money. While we can’t help you with your roommate washing the dishes, we can definitely help you managing the household bills and daily expenses. It is indeed hard to keep track when Jane pays for Saturday’s meal at the restaurant, when Eric who does this week’s grocery shopping, or when Laura paid for yesterday's cinema tickets. Moreover, periodical expenses like gas, internet or electricity are usually divided between flatmates but the amounts paid are different every month. If you still value the old way of doing things, the only way to track these expenses is with pen, paper and a calculator, while praying not to make any mistake or lose your notes. Why not using Tricount instead? Our app enables you to keep track of all household expenses, of who paid them and keeps a running balance of who owes whom. We recommend you to create a tricount per month, so that you can track your expenses monthly and see how much you spent during the year. Also, in case one of your flatmates leaves at the end of the month, you can easily add a new incomer the following month. We advise you however to also keep a copy of all your household bills in a safe place, for example on a shared drive, so that you can keep a trace of all your expenses. To illustrate this we would like to introduce you to Bruno, Marie, Jonas and Claudia. These 4 friends live in a shared house and they divide the responsibility of paying the bills. In September, the gas (86€) was paid by Bruno, the wifi (27€) by Jonas and the electricity (127 €) by Marie, while Claudia went grocery shopping (336€). To manage this situation, they created the tricount “House September”, added the participants (Bruno, Marie, Jonas and Claudia), and registered each expense (gas, electricity, wifi and grocery shopping) with each payer. Then the app did the maths for them and balanced all of the payments out. The best part is that every participant can access the tricount from different devices so you and your flatmates can manage and track the household expenses and bills when and wherever you want. What’s more, you can now also pay back your flatmates through the app with only a few clicks! In shared flats it is normal for each flatmate to pay rent depending on the size of their room and other conditions. Yet, landlords like to be paid in one single payment. This can lead to a chaotic scenario. Tricount helps you address this problem. How? Our app enables you to display in a clear way how the total rent is divided, even if the share of each participant is uneven. One person then simply has to take on paying the rent at the beginning of the month, and he or she will know exactly how much the other flatmates owe him or her. 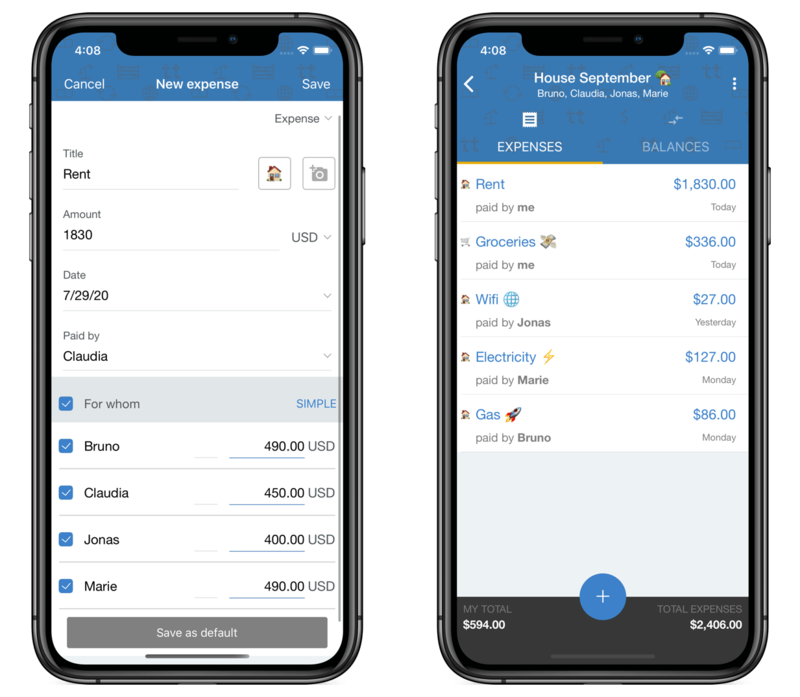 Moreover, if you are bothered with having to register identical expenses monthly, our premium functionality enables you to save your uneven distribution in a permanent way, so that it will be automatically proposed to you for your next expense. Let’s go back to our example: our 4 friends Bruno, Jonas, Marie and Claudia, live in a shared apartment that costs 1830€ per month, and they pay different rents. Bruno and Marie have the biggest rooms (490 €), Claudia the medium one (450€) while Jonas lives in the small one (400 €). Claudia has volunteered to pay the rent for the month of September. Thanks to the expense “Rent September” that they created in their tricount, she can keep track of how much the other flatmates still owe her. 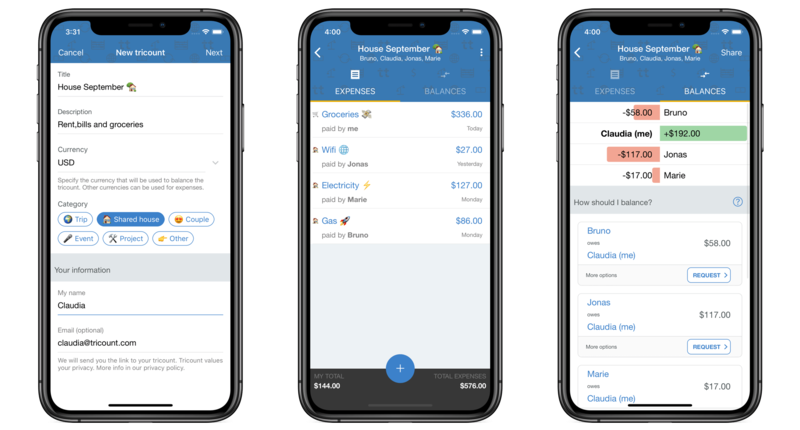 Thanks to Tricount, Bruno, Jonas, Marie and Claudia can now manage their household bills, daily expenses and rent payments in a glimpse through a single and easy platform. Don’t you want to try it? No more troubles with managing split rents and household expenses, keep it simple with Tricount!